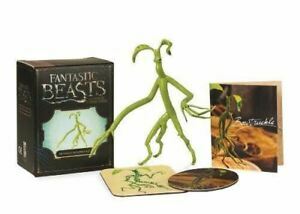 Fantastic Beasts and Where to Find Them: Bendable Bowtruckle by Running Press. Immediate payment of £7.31 is required. Great eBayer, would happily deal with again! Fast delivery , good value , many thanks. Super fast postage and very happy with product A++++++++ ebayer thanks!!! Small bendy bowtruckle.If you like fantastic beasts this is a handy size to display wherever you like.Could even fit in a top pocket! The two magnets are a bonus . Looks great in displayed in the cabinet, and the bonus magnets on the fridge.